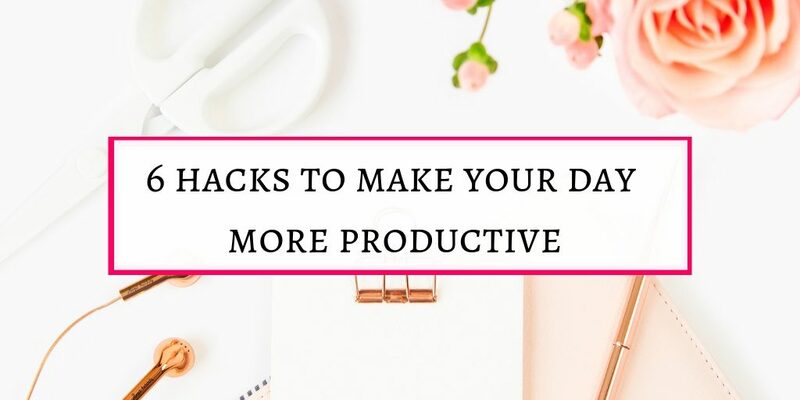 To make your day productive, you need to take action in this very moment. As humans, we are in dilemma for most of the time. Is it the right time to start working on the most important task ? Or I should wait for the perfect time? These are the thoughts we have while starting something new. We are so accustomed to our daily routines that starting something new feels like a daunting task.We procrastinate and procrastinate for a long time. And gradually our ideas go under the dust of procrastination. It is better to start it right now. RIGHT NOW IS THE MOMENT WHICH YOU HAVE. Time doesn’t wait for our starting point.We have to make our starting point our-self. I f we make little changes in our routines and thoughts, we cam accomplish a lot. 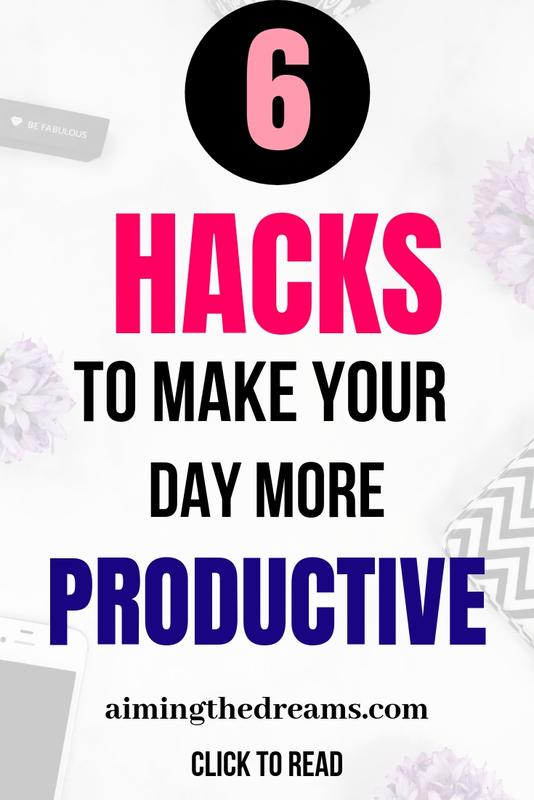 Here are some hacks that will help you in making your day more productive for sure. This is difficult to do when you sleep late at night and you have to go for work. But if you want to be successful in your own goals and dreams, it is necessary to wake up bit early. Morning is the most energised time for most of us. It is better to make use of it. Our minds are charged after sound sleep and rest of few hours. Yep. This is the most easy and fun part. Wake up in the morning and say ” I AM THE HAPPIEST PERSON IN THIS WORLD”. Believe me it works. 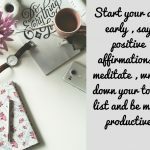 You can make your own positive affirmations for morning. Anything positive. Stay away from negative words.There should be what you want. And nothing which you don’t want. Our subconscious mind cannot understand no. It makes a picture of what we say and keeps it in memory. Start with what you want. Be as specific as you can. Drink a glass of water. Everywhere, drinking water in the morning as well as whole day is a hot topic. And it is because point has some merits in it. It gives your brain clarity. It is good for your gut. Best for flushing out toxins. And setting you for a beautiful day. Better if you add lemon in it. But stay away from salt or sugar. Indulge in meditation for few minutes. Meditation will recharge you for the whole day. Initially it is difficult to concentrate on breathing and meditation but gradually you will learn how to do it. This will calm down your mind. Meditation helps to make your day more productive. It will make your mind free to think new ideas and energy to execute those ideas. If you are not in the habit of meditation, read this and start meditation with few minutes. Physical exercise also gives your body an energy boost. Stretches takes off the tension from your body parts. It will help you in correcting your posture while standing as well as while sitting. All the good hormones set you for a beautiful and productive day. Having good and healthy breakfast set you for a” full of energy” day.Having good proteins and nutrients in breakfast makes you more energetic. If food makes you lethargic , it becomes difficult to concentrate. Morning seems to be very productive and fresh.We have lot of ideas and long to do lists. It feels like we can do everything.But when we start doing the tasks, we get lost in too many things. It is better to write down to do list and stick to it. Planing for five minutes save lot of time and burden of mind . Write down most important tasks at the top followed by least important. And stick to the list. You will find your life a lot easier and days more productive. Giving time frame to your tasks put some pressure on minds to do the work more efficiently.When you finish your first task in given time frame, you feel inspired to start next task with great energy. Sometimes I feel how successful people can accomplish in 24 hours.And my 24 hours goes like that. Then I figured out how to be more productive. These little changes changed a lot. Now I can accomplish lot more. Giving time frame to tasks take pressure off from you. When you have lot of time on your hand, you feel like you can accomplish your task in any time. But giving time frame put some pressure on you to accomplish the task sooner. Taking short breaks in between tasks makes you more productive.Sitting for longer time makes you lethargic and you start feeling tired.If possible you can take small nap. Otherwise short walks in the office do the magic. Please share the post if you like it. I will be really thankful to you for this.